2019-03-07 19:49:11 Margotbean에 의해 마지막으로 편집 됨.
Emily is a villager who lives in Pelican Town. She is one of the twelve characters available to marry. Her home is south of the town square, right next to Jodi's, at the address 2 Willow Lane. She works most evenings at The Stardrop Saloon starting at about 4:00 PM. Emily loves to make her own clothing, but fabric can be difficult to come by in town. Among her favorite gifts are cloth and wool. 12:00 PM Leaves her bedroom and goes to the bookshelf. 4:30 PM Working at the saloon. 12:00 PM Leaves her bedroom. 1:00 PM Arrives at Pierre's to meet up with Jodi, Caroline, Marnie, and Robin for exercise. 12:00 PM Leaves bedroom to stand in front of living room bookshelf. 11:30 AM In her bedroom. 12:30 PM Waiting in her living room. 5:00 PM Working at the saloon. 12:40 PM Looks at bookshelf in her living room. 9:00 PM In her bedroom (only accessible to friends). 1:20 PM Standing in front of the bookcase in her living room. 1:00 PM In Pierre's shop, the room adjacent to it training with other women. 10:20 AM Leaves the house. 11:00 AM Enters Pierre's General Store and joins the aerobics class as they assemble. 4:00 PM Aerobics class ends (quite a workout)! Emily leaves. 4:50 PM Enters the Saloon for work. 12:30 AM Leaves to go home, and to bed. 04:00 PM Leaves her house and goes to the saloon. 4:00 PM Arrives at the saloon to work. Most days Emily wakes up at about 9:00 AM, moves around her home for a few hours before leaving for work at the saloon for 3:30 PM. Her shift at the Saloon ends at 12:30 AM when she proceeds home for the night. 9:00 AM Wakes up for the day, spends time in bedroom. 12:00 PM Moves around her house. 3:30 PM Leaves home to walk to the saloon to work. 11:00 AM Leaves home to meet Marnie, Caroline, Jodi, and Robin at Caroline's house for exercise class. 1:00 PM Exercise class begins. 4:00 PM Walks to The Stardrop Saloon for work. 10:30 AM Visits Harvey's Clinic for annual checkup. "Most of us visit the doctor for a yearly check-up." 1:30 PM Continues checkup. "Doctor, I'd like to go with the 'natural remedy' if possible." 10:00 AM Visits the Community Center. "What a lovely loom. I'm in heaven right now." 3:30 PM Leaves home to walk to The Stardrop Saloon for work. 6:00 AM Standing in front of the stove in her kitchen. 8:30 AM Leaving the house. Walking towards town. 9:00 AM In Pelican Town, walking towards her home, 2 Willow Lane. 9:40 AM In her home. Walks towards the area to the left of the kitchen. 10:00 AM Stands next to the blue stool and faces the kitchen area. 11:40 PM Walks to bed. 11:50 PM Goes to bed. Sleeping. 6:00 AM Standing on the front porch, closest to the mailbox. 1:00 PM Enters the house. 1:10 PM Moves around the house. 10:00 PM Walks to bed. 10:20 PM Goes to bed. Sleeping. 6:00 AM Standing in front of the kitchen stove. 6:20 AM Moves around the house. 10:00 PM Goes to bed. Sleeping. 10:00 PM At home. Goes to bed. Emily lives with her sister Haley, and together they care for their parents' home, who have been traveling the world for the past two years. She works with Gus, who employs her part-time at the saloon. She is also friends with Sandy, whom they both mention. Sandy, at her first meeting with the player, claims to have been aware of the farmer's presence even before access to The Calico Desert was opened, saying that she had written to Emily about the newcomer. Several dialogues and cutscenes reveal that Clint has romantic interest in Emily, though he is too shy to tell her. You can give 에밀리 up to two gifts per week (plus one on 그녀의 생일), which will raise or lower 그녀의 너와의 우정. Gifts on 그녀의 생일 (봄 27) will have 8× effect and show a unique dialogue. At any friendship level greater than zero friendship points, you may receive a gift in the mail from 에밀리. The chance of receiving a gift in the mail increases as your friendship with 에밀리 increases. How are you doing? I hope you enjoy the gift I've sent you... Well, goodbye! Emily is asleep in her room. The screen pans and fades, and you find yourself viewing Emily's dream. It's a dreamscape of abstract shapes and colors, clouds, and palm trees. 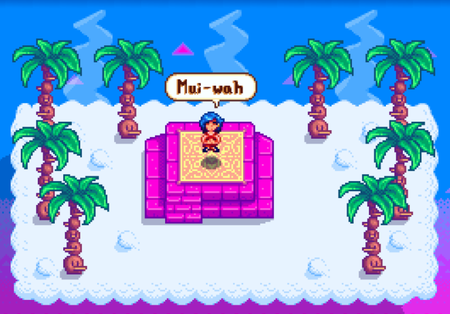 Emily floats above a purple stone structure on a large cloud. She is floating, meditating and chanting "power words." You appear out of the cloud, surprising her. She wonders what you are doing in her dream. Rainbow streaks fly by and she sees them as some kind of sign or omen. You disappear and she wakes up. She gets out of bed and says to herself that there is something special about you; she believes that your destinies are somehow intertwined. After reaching 3 hearts with Emily she will send you a recipe in the mail. Salad Flip this letter over for instructions on how to make a super-healthy meal! You'll feel energized. See you soon. Enter town on a sunny day. Cannot be triggered in winter. Emily leaves her house on a sunny day. Three parrots fly by, and she waves and refers to them as her "friends". After a moment, she continues walking but quickly stops, confused. A fourth parrot flys in too low and smacks against the window of her house. The parrot is injured. Emily rushes over and cradles the poor thing, promising that she will take care of it. Emily will now have a parrot in her room. The parrot hops around and will squawk if you go up to it and press the "check" button. Visit Emily's house when she's there. This event was formerly Emily's four heart event, it was changed in version 1.1. In that update it got a new unique song and dialogue, as well as animation and visual improvements. After reaching 7 hearts with Emily she will send you a recipe in the mail. Red Plate Flip this letter over for instructions on how to make a super-healthy meal! A letter in the mail will invite the player to the Mayor's Manor that same day during open hours. I have this crazy new idea that I want to involve you in... It's called "Clothing Therapy". Please come to the Mayor's house today to see what it's all about. Enter the Mayor's house. Emily will explain the purpose is to help the townspeople express their true selves in the form of clothing. Attending are Mayor Lewis, Abigail, Shane, Robin, and Clint. Each one takes a turn going behind the curtain. Emily instructs them to choose whatever clothes "speaks to them", put it on and then show the world without fear. One by one, you get to see each character's choice. Shane puts on a full "goth" outfit. Robin puts on a fine dress and lets her hair down, embracing her feminine side. Mayor Lewis comes out with a fancy hat, cape, and cane. Abigail comes out in a full suit of armor. Clint is apprehensive about the whole thing, but after Emily coaxes him, he goes ahead. He comes out in a button-up shirt, pink shorts and a beret. Emily sees it and says "Awww... cute! ", which makes Clint sad. After he is gone, Emily approaches you with romantic interest. Clint bursts in, saying he's too embarrassed to go out in his new outfit. He sees what's going on and feels awful. He makes some indirect remarks about it and leaves. Emily is confused. You go camping with Emily in the Secret Woods. There is strange grunting coming from the forest. She says it's cold and snuggles up close to you by the fire. A bear comes out of the woods and approaches your campsite. It grunts loudly and you both jump and dive into the tent. The bear sniffs around and leaves. Emily says that one of the sleeping bags is still out there, and she's not willing to go out and get it... so you have to share a bag. You hear movement in the tent, the screen fades and the day ends. “ “Thanks for joining me last night... I had a great time. I'm actually glad that bear showed up! Note that if you have not yet upgraded to the Steel Axe, you won't be able to get to the Secret Woods to complete this event. However, the event can still trigger on a subsequent night after 10pm by going to the Secret Woods once you've gained access. Once married, Emily will move into the farmhouse. Like other marriage candidates, she will add her own room to the right of the bedroom. She'll also set up a small crystal garden behind the farmhouse where she'll sometimes go to meditate. On rainy mornings, Emily may offer you Cloth, Wool, Duck Feather, Refined Quartz, or Bean Hotpot. On rainy nights, she may offer you dessert that is "raw", "gluten-free", and "sweetened only with cactus syrup": Rice Pudding, Blueberry Tart, Cookie, or Chocolate Cake. 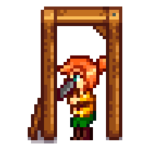 On days when Emily stays inside the farmhouse all day, she may offer you Cloth, Wool, Duck Feather, Refined Quartz, Bean Hotpot, Coffee, or an Omni Geode. "Fresh Fruit": Emily will send you a letter on the 6th of Spring, year 2, requesting an Apricot. The reward is 600골드 and 1 Friendship heart. Emily may randomly request an item at the "Help Wanted" board outside Pierre's General Store. The reward is 3x the item's base value and 150 Friendship points. Although not requested by Emily, fulfilling the quest "Clint's Attempt" will reward you with 1 Friendship heart with Emily. Note that fulfilling this quest does not count against Emily's 2 gift per week limit. Emily's look evolved over the years the game was in development. Here's a timeline showing how ConcernedApe's art and Emily's style changed over the years before the game was launched. 1.1: Added ability to marry, updated heart events, dialogue and schedule. 이 문서는 2019년 3월 7일 (목) 19:49에 마지막으로 바뀌었습니다.